The Lakers gathered around for a talk, and the topic veered away from the discussion that usually involves basketball. So this time, the main speech did not involve Lakers coach Byron Scott stressing about the need to compete. It did not involve Lakers guard Kobe Bryant suggesting the same thing. Instead, Lakers rookie point guard D’Angelo Russell expressed his regret over secretly recording a video that went public of teammate Nick Young admitting infidelities while being engaged to rapper Iggay Azalea. As Lakers guard Jordan Clarkson recalled, Russell “looked at us like men” and showed remorse for his behavior before the Lakers’ 102-100 overtime win over the Miami Heat on Wednesday at Staples Center. But a source close to Young has remained adamant that Russell has not apologized directly to Young. By Young’s own choosing, the source added Young was not present when Russell addressed the team before the game on Wednesday. As of now, Young has not accepted any apology. Young also declined to field questions from reporters before the game and only offered a statement that lasted for about a minute. 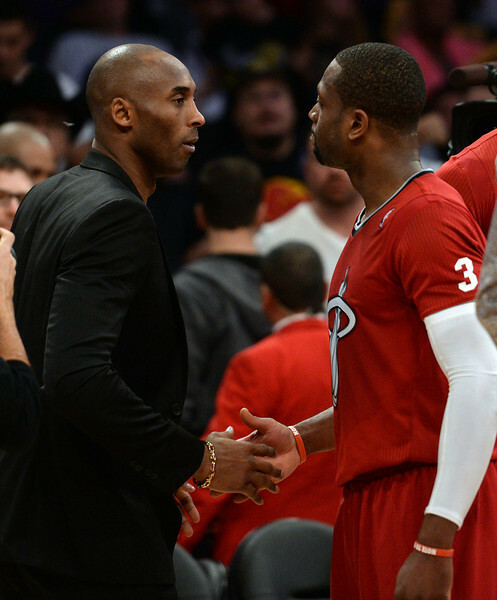 The visit seemingly lasted forever as former Lakers and Clippers forward Lamar Odom visited Kobe Bryant in the trainer’s room following the Lakers’ 92-90 victory over the Miami Heat on Wednesday at Staples Center. That visit marked a stark contrast to the visit Bryant made in mid October at a Las Vegas hospital after his former teammate had strokes and kidney issues. 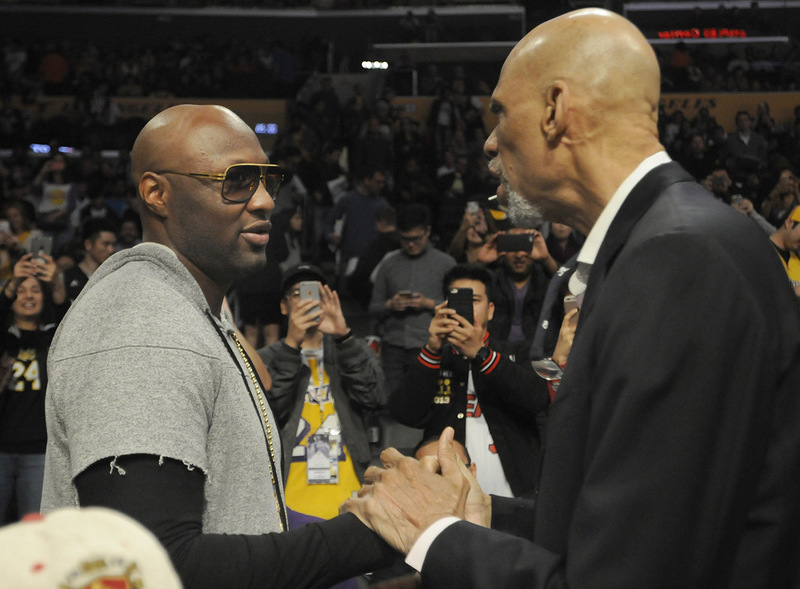 Bryant invited Odom to attend the game in what marked his first appearance at Staples Center since he was hospitalized five months ago for falling unconscious at a Nevada brothel. In the first half, Odom hugged Lakers president Jeanie Buss. Odom, who won two NBA titles as a key Lakers reserve from 2004 to 2011, also sparked cheers when the Staples Center scoreboard featured him. 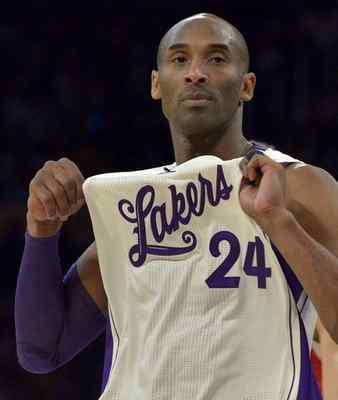 So did Bryant, who won two NBA titles with Odom when he played on the Lakers from 2004 to 2011. So did Miami guard Dwyane Wade, who became close with Odom when they played together during the 2003-04 season. When Odom was initially hospitalized, few expected that he would overcome such a tumultuous episode. But within a week he started physical therapy and was transferred to a Los Angeles hospital. In January, Odom then was transferred to a private facility. Bryant hoped Odom’s presence would accomplish two things. 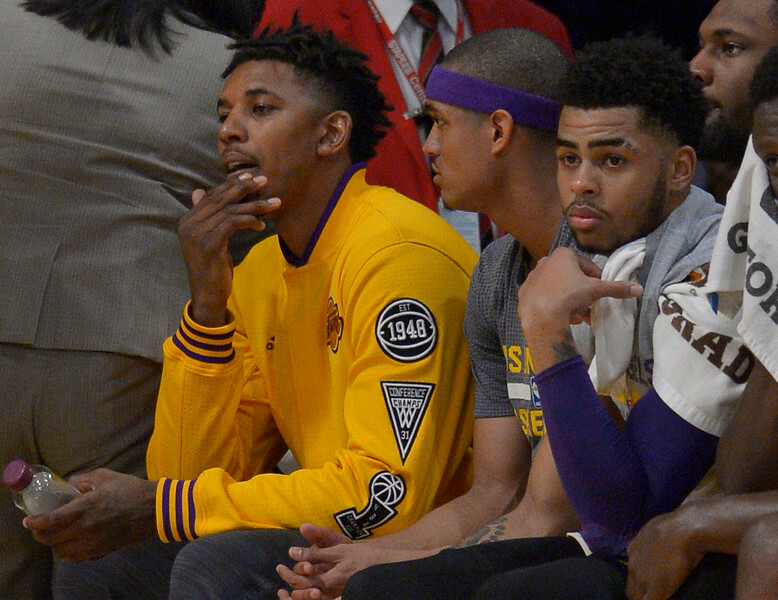 Bryant believed it could provide perspective to his teammates as they dealt with the fallout surrounding Lakers rookie point guard D’Angelo Russell secretly recording a published video that showed teammate Nick Young admitting to infidelities. 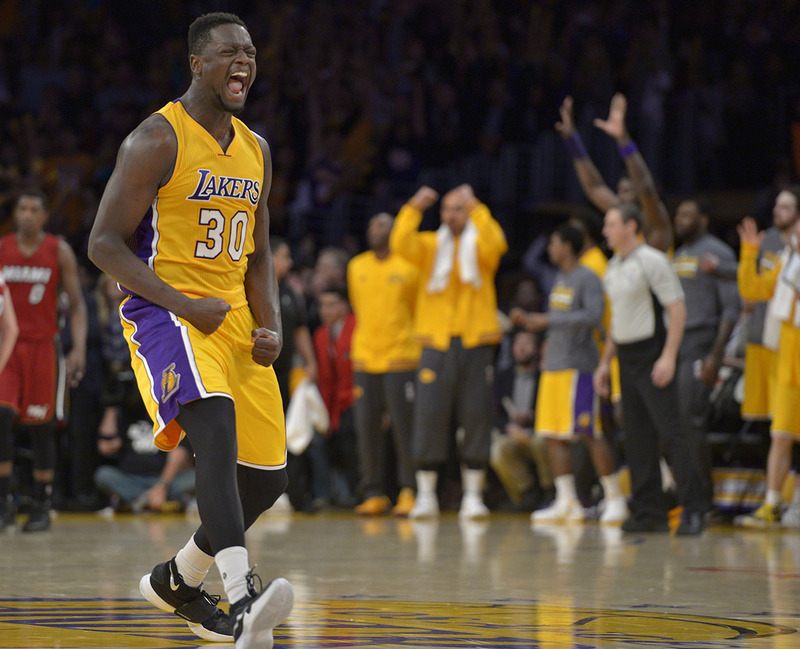 Bryant also expressed optimism the experience would aid Odom’s return to normalcy. 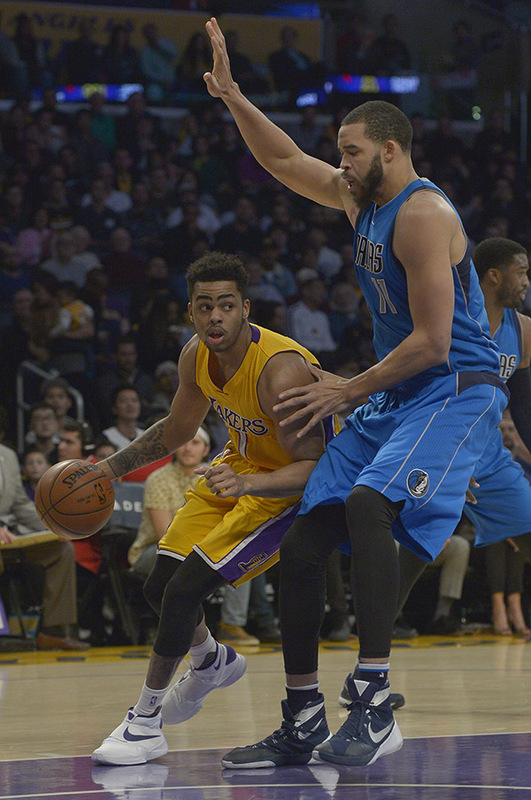 The deflated feeling wore on D’Angelo Russell’s face. 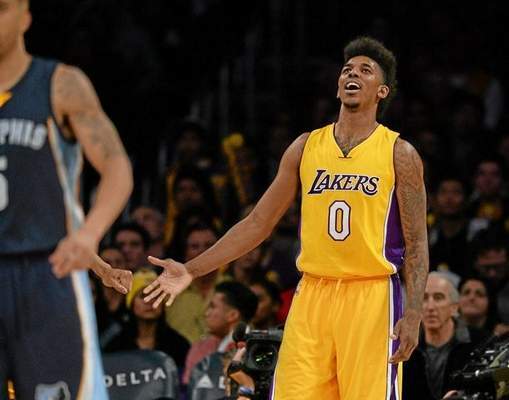 This time the frustration had little to do with another Lakers loss or his fluctuating role. It had everything to do with the remorse Russel said he felt over a secretly recorded video recently going public that showed teammate Nick Young admitting seeing another woman other than his fiance, Iggy Azalea. At a very methodical pace, Lakers rookie point guard D’Angelo Russell moved around the practice court on Wednesday and took shots in what marked an extended post-shootaround workout. Russell moved at a quicker speed when he walked past reporters without missing a step. A large media contingent arrived at the Lakers’ practice facility at El Segundo hoping to ask Russell to address a secretly taped and since publicized video that entailed teammate Nick Young sharing he had a relationship with a woman other than his fiance, Iggy Azalea. “Nothing to talk about,” Russell said as he went toward the Lakers’ trainer’s room. Later, Russell exited the Lakers’ practice facility with three security guards escorting him to his car as he walked to the parking lot. 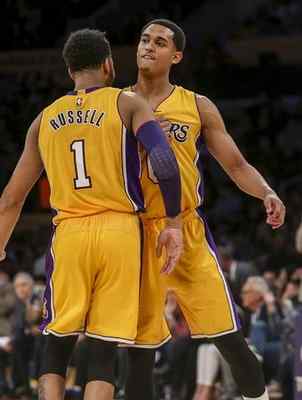 The Lakers said that Russell and Young will address the media before Wednesday’s game against the Miami Heat at Staples Center. Russell and Young have had private discussions regarding the incident, according to team sources familiar with the situation. That dialogue will likely continue, but skepticism persists on whether their friendship can be salvaged. Young has missed the past 10 games, including the last two for what the Lakers attributed to a stomach bug. 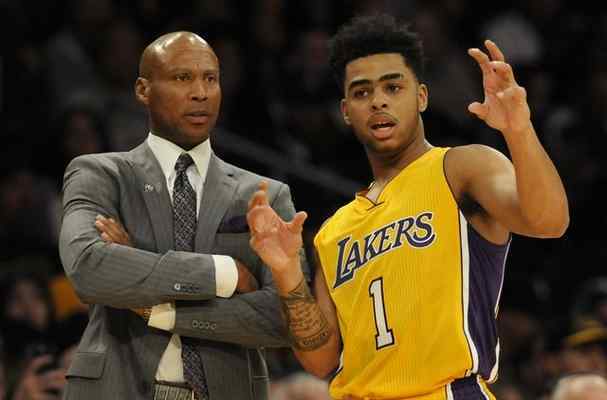 But Lakers coach Byron Scott said Young will be available to play on Wednesday against Miami. Scott called the situation an “internal manner” and declined to address specifics. The moment will attract a passionate crowd and media contingent usually reserved for Lakers playoff games. Every play could become emotional. Every second that passes will only spark reminders of the finality of it all. Yet, Kobe Bryant insisted he will not step on the floor for his final game against the Utah Jazz on April 13 at Staples Center seeing his basketball life flash before his very eyes. The pain persisted, leaving both Kobe Bryant and Dwyane Wade with only one option amid a sleepless evening in Miami. Those notes hardly just involved basketball plays. They involve medical charts, rehab routines and dietary suggestions. Bryant has tried to maximize all those areas as he recovered from season-ending injuries to his left Achilles tendon (April 2013), left knee (Dec. 2013) and right shoulder (Jan. 2015). Wade has had to do the same thing amid limitations in 2013-14 (knees), 2014-15 (left hamstring) and 2015-16 (thigh bruise). It appears likely Bryant and Wade will share more notes when the Lakers (15-59) host the Miami Heat (43-30) on Wednesday at Staples Center. Bryant said he and Wade have “developed a great friendship” ever since he entered the NBA during the 2003-04 season. The two stars took pictures together. Buddy Hield soaked in Kobe Bryant’s advice. The Oklahoma senior put on a show that made Bryant nod his head in approval. Hield strung together 37 points in a win over Oregon on Saturday in Anaheim in the West Region Final. Hield frequently looked back at Bryant after every made basket. That left Bryant predicting big things about Hield well after the Sooners’ Final Four matchup against Villanova on Saturday in Houston. SALT LAKE CITY — The so-called “Swaggy DNP’s” are piling up by the game. But this time, the Lakers say it has nothing to do with inconsistent performances or Byron Scott’s preference for his other small forwards. Instead, the Lakers said Young will remain in Los Angeles recovering from a stomach bug while the Lakers (15-58) visit the Utah Jazz (36-37) on Monday at Vivint Smart Home Arena. Young also missed Sunday’s loss to Washington at Staples Center because of the same ailment. Yet, he had experienced healthy scratches for the previous seven games. In addition toward averaging 7.3 points on a career-low 33.9 percent clip, Young has dealt with recent frustration off the court. Activist Alexis Jones accused Young and Jordan Clarkson last week of sexual harassment near a traffic intersection in the Hollywood area, charges that Young and Clarkson have since chalked up to a “misunderstanding from both sides.” Still, those familiar with Young’s thinking has said he has increasingly considered pursuing litigation charges.